Ochre Imprints showcases the work from the three art centres on the Tiwi Islands; Munupi Arts and Crafts, Tiwi Design and Jilamara Arts and Craft. The exhibition includes work by both prolific and emerging artists demonstrating the diverse artistic talent evident on the Tiwi Islands. Tiwi Islanders continuously practice the art of body painting (jilamara) for ceremonial purposes. The patterning used is primarily decorative with the emphasis on strength of design rather than narrative. These designs are now translated onto a variety of media such as painting, carving, print making, textiles, ceramics and silk screen printed fabrics. Ochre is an inherent part of Tiwi life. The natural earth pigments are collected and used to adorn the body for ceremonial purposes during Pukumani (funeral) and Kulama (initiation/yam) ceremonies. Each artist interprets jilamara in a unique and distinctive fashion. 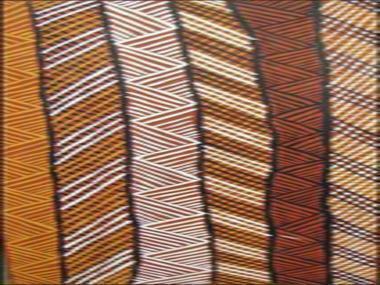 This is demonstrated by the varied styles that are noticeable in Tiwi art. Designs can be organised and uniformed creating a structured and sophisticated aesthetic or free flowing and gestural.